TENOR UKULELE. HEAVY GAUGE. GROUND NYLON. 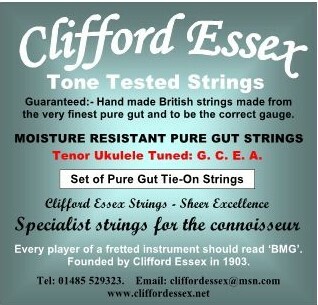 Tenor ukulele strings, medium, heavy and light gauges including a set with a silver wound 3rd. If in doubt order medium gauge. TENOR UKULELE. LIGHT GAUGE. GROUND NYLON. MOISTURE RESISTANT PURE GUT TENOR UKULELE. TENOR UKULELE. MEDIUM GAUGE. WITH A WOUND 4th (LOW G).